The largest selection of modular, manufactured, single section, repossessed and pre-owned homes in the entire state of Kansas. 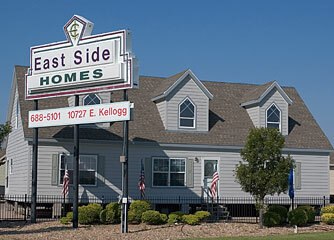 East Side Homes Proudly serving Kansas and surrounding states since 1987. We are noted for being detail oriented and our customer service before and after the sale. East Side Homes has the largest selection of modular, manufactured, single section, repossessed and pre-owned homes in the entire state of Kansas. Being the largest volume dealer in Kansas, East Side Homes has changed with the times. With financing that offers a fully inclusive land and home package including garages, basements, utility improvements, storm shelters, driveways, etc. If you are on a little smaller budget we can offer programs for first time home buyers, single parents and people with zero or less than average credit.